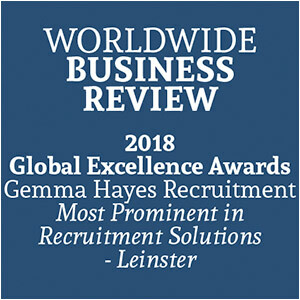 Gemma Hayes Recruitment prides itself on being a one stop recruitment solutions provider catering for all of your recruitment needs. Our core business expertise lie in the recruitment of Permanent, Temporary and Contract work within the Industrial, Commercial, Manufacturing, Production, Pharmaceutical & Medical Devices, High Tech, FMCG, Technical & Engineering, IT, Banking, Finance and Accounting and all other industry sectors one can think of. Our services to clients spans from Staffing, Executive Search, E-Recruitment and psychometric assessments, along with assistance in interviewing with you. We operate on a local, regional, national and international level. Gemma Hayes Recruitment can identify people with the skills and talents required in any field, anywhere in Ireland and further a field. Proactive marketing and career counselling of candidates seeking work. Positively discourages discrimination and promotes the placement of people with disabilities. Clients ranging from a local level to blue chip multi-nationals in all industry sectors and market sectors, placing from one temporary worker to staffing entire companies. We offer a single point of contact for all of your recruitment requirements. Specialist staff with first-hand experience and knowledge of the sectors they represent. Site visits and face-to-face briefings to all customers to ensure our full understanding of every client, their environment and dynamics allowing us accurately match an employee to your vacancy, both in terms of skills and personality. We handle every aspect of the recruitment process from advertising through screening to the preparation of the final short list, to offer or rejection stage and completion of the process. We aim to assist you with driving your business forward and treat your business as if it were our own company we are recruiting for. We even assist you and join you when interviewing, if required. We offer industry advice from employment law, salary scales and local employment conditions. The first step is to place your vacancy with us. You can do this via a face to face meeting, telephone, fax, email or regular post. The second step is candidate attraction. Candidate Selection is performed via registration and Interviewing. All applicants to your vacancy are fully screened and if successful at this stage are registered and interviewed face to face to ensure their suitablility to your vacancy. Once we are 100% confident of any applicants' abilities we will contact you. We recommend for each vacant position you interview at least 4 prospective employees. We block-book these interviews for you to ensure that you meet the candidates over a one or two day period. This enables you to keep all candidates fresh in your mind when selecting your choice. We also recommend two round interview stages. If you are not convinced after your interviews, then we get back to the drawing board and re-start the process. We like to think that we have listened to your needs fully, therefore, getting the process correct our first time round, every time. When you have come to your decision, you come to us to make an offer to your selected applicant. We contact the applicant and make the offer on your behalf. We allow the applicant 24 hours to come to a decision and when they contact us with their decision, we inform you immediately. You will recieve your invoice within seven days of your new staff members start date. We offer both paper and electronic invoicing option, Transferring invoices electronically is a very effective method both timewise and ensures accuracy of data. At Gemma Hayes Recruitment we operate to the highest standards when it comes to quality in all areas of our business. We constantly review, and maintain our high standards of practice to enable us to deliver these high standards that we aim to constantly achieve. Our most important means of reviewing these standards is via our clients and your constant feedback, which we take very seriously.